A two-week regional training workshop on climate change has started here with a warning that the Caribbean could suffer billions of dollars in losses over the next few years as a result of climate change. “As a region, we have to assist each other in every conceivable way imaginable,” said Water, Land, Environment and Climate Change Minister Robert Pickersgill at the start of the workshop that is being organised by the Belize-based Caribbean Community Climate Change Centre (CCCCC) in partnership with several regional governments and the Mona campus of the University of the West Indies (UWI). It is being held under the theme “The use of sector-specific biophysical models in impact and vulnerability assessment in the Caribbean”. Pickersgill said that Caribbean countries needed to work together to boost technical expertise and infrastructure in order to address the effects of the challenge. 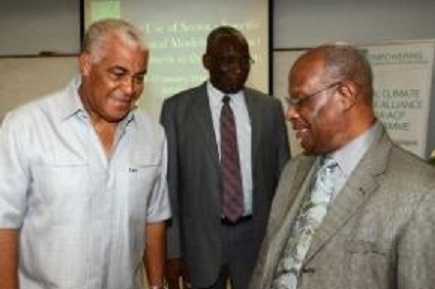 He said global climate change was one of the most important challenges to sustainable development in the Caribbean. Citing a recent report from the Inter-governmental Panel on Climate Change (IPCC), he noted that while the contribution of Caribbean countries to greenhouse gas emissions is insignificant, the projected impacts of global climate change on the Caribbean region are expected to be devastating. Pickersgill said that according to experts, by the year 2050, the loss to the mainstay tourism industry in the Caribbean as a result of climate change-related impacts could be in the region of US$900 million. In addition, climate change could cumulatively cost the region up to US$2 billion by 2053, with the fishing industry projected to lose some US$140 million as at 2015. He said the weather activity in sections of the Eastern Caribbean over the Christmas holiday season was a prime example of this kind of devastation. The low level trough resulted in floods and landslides in St. Vincent and the Grenadines, St. Lucia and Dominica. At least 15 people were killed and four others missing. The governments said they would need “hundreds of millions of dollars” to rebuild the battered infrastructures. “For a country the size of St. Vincent and the Grenadines, this loss is significant and could result in their having to revise their GDP (gross domestic product) projections. (Therefore), while one cannot place a monetary value on the loss of lives, the consequences in terms of dollar value to Small Island Developing States (SIDS) is also important,” Pickersgill said. “It only takes one event to remind us of the need to become climate resilient in a region projected to be at the forefront of climate change impacts in the future,” Pickersgill said, adding that he hoped the regional training workshop would, in some meaningful way, advance the Caribbean’s technical capabilities to meet the future projections head-on and be successful. He said the workshop has particular relevance to Jamaica as one of the SIDS that is most vulnerable to climate change. The two-week programme forms part of the European Union (EU)-funded Global Climate Change Alliance Caribbean Support Project, which is geared towards the creation and financing of policies that can reduce the effects of climate change as well as improved climate monitoring within the region. The Global Climate Change Alliance project is to be implemented over 42 months and will benefit Antigua and Barbuda, Bahamas, Barbados, Belize, Cuba, Dominica, Dominican Republic, Jamaica, Grenada, Guyana, Haiti, St. Kitts and Nevis, St. Lucia, St. Vincent and the Grenadines, Suriname, and Trinidad and Tobago. CCCCC Programme Manager, Joseph McGann, said the project would include several activities including: enhancing national and regional institutional capacity in areas such as climate monitoring; data retrieval and the application of space-based tools for disaster risk reduction; development of climate scenarios and conducting climate impact studies using Ensemble modeling techniques; vulnerability assessments that can assist with the identification of local/national adaptation; and mitigation interventions. By caribbeanclimate in 5Cs in the News on January 8, 2014 .